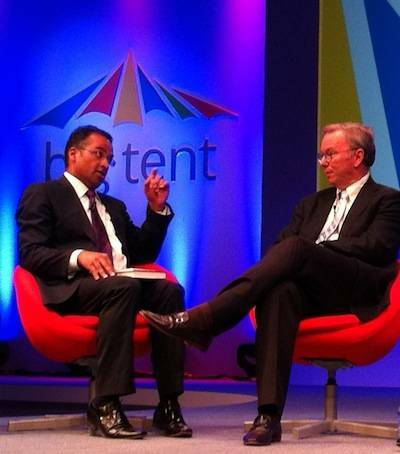 Big Tent Google is just conforming to the way the global tax system works, the company's executive chairman Eric Schmidt said today as he rejected the criticism levelled at the ad giant by Labour leader Ed Miliband. "We're trying to do the right thing, not the wrong thing," Schmidt said. He was speaking at Google's annual Big Tent event in Watford - which was completely overshadowed by the tax row that has engulfed the multinational in the UK. The Google co-founder added that it was up to governments around the world to "sort this out", and reminded the audience that "taxes are not a choice". Schmidt said: "Google is following the international tax regime ... Virtually all American companies operate like this." He agreed, however, that there was "no doubt governments need more money." Governments have a lot more power than we do ... if the law changes, we will follow it. Schmidt repeatedly said that Google adores the UK and added that any changes to the tax rules brought in, for example, by a Labour government, would be respected. As for the value of Google to the British economy, Schmidt pointed out that the company's "free" services were widely used by UK citizens. Schmidt is currently touting The New Digital Age: Reshaping the Future , and so was unsurprisingly keen to explore some of the themes of his book with the gathered crowd. We need to fight for privacy or we are going to lose it. There's this concern that we are somehow going to misuse this data and we're not telling you. This is simply not the case. I can assure from a privacy perspective ... we would lose you and not get you back. He added that Google had a "clear business incentive" to protect a user's data and warned that everyone should fight for privacy online "before it is taken away from us". His punchline was to say that Google is not the company eroding privacy on the web - that's other less scrupulous outfits, apparently. When pressed once more about whether Google had been "wrong" to cough up a piddling UK tax bill, as argued by Miliband earlier today, Schmidt let slip an amusing blooper.